Of all the classical organizations to which I have belonged in over sixty years, from the beginning I found CAMWS the most congenial. The meetings were profitable, one could meet many colleagues, and was able to support tangible efforts to enable both teachers and students to advance their careers. The travel fellowship which I endowed years ago makes it possible for individuals to experience the grandeur of our discipline. That is most gratifying to me. 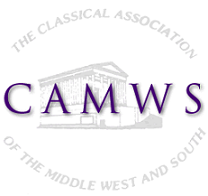 CAMWS has never been very rich in terms of dollars, but it has always been very rich in terms of people—be they teachers, professors, graduate students, or other friends of Classical Studies. Their loyalty to CAMWS and their careful stewardship of its resources have kept the association going strong for 110 years and allowed it to continue offering competitive scholarships, travel grants, and other awards, even during tough economic times. The current campaign will enable CAMWS to increase its support for students and teachers who dream of participating in archaeological field work but lack the financial means to do so. Who would not want to help make their dreams come true by contributing generously to this campaign? One word, which summarizes what CAMWS means to me: AMICITIA. I donate to CAMWS because I attended my first meeting while still an undergraduate over twenty years ago; CAMWS was the first professional organization I joined. Over the years CAMWS has given me the opportunity to travel, learn, and celebrate the accomplishments of my students. I am grateful for what I have received and want to do my small part to continue our mission for the next generation of scholars. I donate to CAMWS because the organization has been such a vital part of my career for more than four decades. One of the things that distinguishes CAMWS from other professional organizations is the wide array of awards that we give to deserving students and colleagues. These have enhanced programs and recognized collegial distinction for generations, whether through sending teachers and students abroad, supporting school projects through CPL, or publically recognizing excellence in scholarship, teaching, and service. I feel it is our responsibility to see that these opportunities continue for the next generation. A case in point is the new CAMWS initiative of Excavation and Field School Awards, which I am happy to support with another gift this year. I began attending CAMWS in 1983, relative newcomer compared to many. At the time I also attended another professional conference in the spring, but after a couple of times with CAMWS, I gave that one up. The CAMWS conference and the organization have never failed to leave me feeling energized and committed. After three decades, I am delighted to have the capacity to support the organization financially, part of what I hope will be a widespread effort. We have celebrated 100 years, but our gifts now can help ensure a another celebration at 150 and at 200 years. I see this gift not just as an act of philanthropy, but as an investment in the future of Classics and the liberal arts in general. My gift averages to less than $100 per year. It is not a gift I could have made 20 years ago. But I hope you will all join me in this effort within your ability to do so, and consider CAMWS a regular part of your philanthropic commitments. If you can afford it, you give for what you care about: for me, Oxfam, the American Jewish World Service, the Fistula Foundation, and Doctors without Borders; the cultural life of the place I live—the University Musical Society, the Michigan Theater, the Detroit Institute of Art; The Country Dance and Song Society. And the capital campaigns of the Society for Classical Studies and CAMWS, because these organizations nurture the discipline I love. A student can be inspired for a lifetime by one summer of fieldwork, and the CAMWS awards can make that possible. How could I not support it? Because I feel fortunate to be part of an organization that supports and promotes Classics in all its manifestations: from high school to grad school, from students to scholars, from Vergil to Vesuvius! I regard it as “home maintenance,” for CAMWS was my professional home as a professor. It has many more classical Greek and Roman elements than my residence has, and we know that homes with those elements require more maintenance than do plain homes lacking them. I want the home to be in the best shape for the present inhabitants, and to be there for the generations to come, like the temple at Bassae or the Pantheon. I am grateful to CAMWS for the many opportunities it has given me to read papers before an audience of friendly colleagues and to receive invaluable feedback. I am grateful to CAMWS for its efforts to recognize oustanding teaching, the authoring of pedagogical as well as scholarly books, and outstanding undergraduate work. I am grateful to CAMWS for being an organization which welcomes graduate students into the profession. I am grateful to CAMWS for its support of teacher and student scholarships and travel funds. I am grateful to CAMWS for it efforts to nuture the next generation of classicists and Latin teachers.